Unsurpassed in his combination of elegance and impeccable artistry, Elmar Oliveira is one of the most distinguished violinists in the world today. His commitment to a wide spectrum of the violin world manifests itself in numerous ways, such as consistently expanding repertoire boundaries as a champion of both contemporary music and rarely-heard works of the past, devoting considerable energy to the development of younger artists, and enthusiastically supporting the efforts and art of modern violin makers. Mr. Oliveira has become a familiar and much-admired figure at the world's foremost concert venues. His rigorous international itinerary includes appearances with many of the world's great orchestras, including the Boston Symphony, Buffalo Philharmonic, Chicago Symphony, Cleveland Orchestra, Colorado Symphony, Detroit Symphony, Helsinki Philharmonic, Leipzig Gewandhaus, London Philharmonic, Los Angeles Philharmonic, New York Philharmonic, Philadelphia Orchestra, Rochester Philharmonic, Saint Louis Symphony, San Francisco Symphony, Seattle Symphony, and the Zurich Tonhalle, to name a few. He has also made extensive recital tours of North and South America, Australia, New Zealand and the Far East. A prodigious recording artist, Elmar Oliveira's discography on Artek, Angel, SONY Masterworks, Vox, Delos, IMP, Naxos, Ondine, and Melodiya covers a wide range of works from the Baroque period to the present. His best-selling recording of the Rautavaara Violin Concerto with the Helsinki Philharmonic (Ondine) won a Cannes Classical Award and has appeared on Gramophone's “Editor's Choice” and other “Best Recordings” lists around the world. He was also a Grammy nominee for his CD of the Barber Concerto with Leonard Slatkin and the Saint Louis Symphony. Other recording highlights include the Brahms Concerto and Saint-Saëns Concerto No. 3 with Gerard Schwarz and the Seattle Symphony (Artek), violin sonatas of Respighi and Pizzeti (Artek), Favorite Encores with pianist Robert Koenig (Artek), the complete Brahms sonatas with pianist Jorge Federico Osorio (Artek), the Joachim Concerto with the London Philharmonic (IMP), and the Tower Concerto (composed for him) with the Louisville Orchestra (d'Note Records). Of historical significance are two unique projects: a CD released by Bein & Fushi of Chicago, featuring Mr. Oliveira performing on some of the world's greatest violins (fifteen Stradivaris and fifteen Guarneris del Gesus), and a CD of short pieces highlighting the Library of Congress's collection of rare violins. Mr. Oliveira's repertoire is among the most diverse of any of today's preeminent artists. Hailed for his performances of the standard violin literature, he is also a much sought-after interpreter of the music of our time. He has premiered works by such distinguished composers as Morton Gould, Aaron Kernis, Ezra Laderman, Benjamin Lees, Andrzej Panufnik, Krysztof Penderecki, Joan Tower and Charles Wuorinen. He has also performed seldom-heard concerti by Alberto Ginastera, Joseph Joachim and Einoujuhani Rautavaara, among others. Elmar Oliveira remains the only American violinist to win the Gold Medal at Moscow's prestigious Tchaikovsky International Competition. He was also the First Prize winner at the Naumburg International Competition and the first violinist to receive the coveted Avery Fisher Prize. 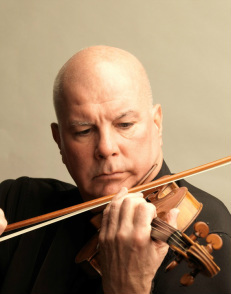 The son of Portuguese immigrants, Mr. Oliveira was nine when he began studying the violin with his brother John. He later continued his studies with Ariana Bronne and Raphael Bronstein at the Hartt College of Music and the Manhattan School of Music, where Mr. Oliveira also received an honorary doctorate. Other honors include an honorary doctorate from Binghamton University and the Order of Santiago, Portugal's highest civilian honor. He has served on the juries of numerous violin competitions including the Montreal, Indianapolis, Naumburg, and Vianna da Motta. Elmar Oliveira is a Distinguished Artist in Residence at the Lynn University Conservatory of Music in Boca Raton, Florida. He performs on a 1729/30 Guarneri del Gesu called the “Stretton,” and on several outstanding contemporary violins.